Hello everyone! I couldn't find a solution to my problem in older topics, so I decided to create a new one. This is my 3rd cycle in aeroponics and i'm still trying to adjust my tecniques. I have 4 Skunk Kush from Sensi Seeds growning in aeroponics, in a 1x1m growbox, Amazon aeroponic system, I keep pH between 5.2-5.5 in vegetative and 5.8-6.1 in flowering. I use Canna Aqua A+B, PK13/14, Rhizotonic, Cannazym, Mineral Magic and Michorryzae. I'm having problems with my ECmeter, but I should be around 1.8-2.0mS and I change the solution every 2 weeks. Every day I refill with 5lt water with 3-3.5 ml of pH down and 10ml Canna Aqua Flores. Air temperature is currently 31°C by "day" and 25-26 by "night", humidity bout 65%. I'm keeping irrigation always running, so it'like having a humidifier. I run 3 led lights, rated each 300, 450, 1500W, but 500W consumed in total. I am currently 3weeks away from end of flowering, but I repeatedly encountered this problem over the cycles. I tried adding mineral magic, for a calcium-magnesium deficiency, calcium nitrate, adding PK13/14, lowering and raising EC. Lately I also found out that I have some guests, piercing the leaves, so maybe they're accountable too. From my reading, those symptoms could be several things - or a combination of more than one. Your temps are on the hi side, so it could be heat stress. How close are your lights? Ive had similar looking leaves on top from too much light. Yours sound like its mostly lower leaves, so this is less likely, but may be contributing. Are you foliar spraying? If there are droplets of water left on the leaves when the light is on, it can burn the leaves like that. 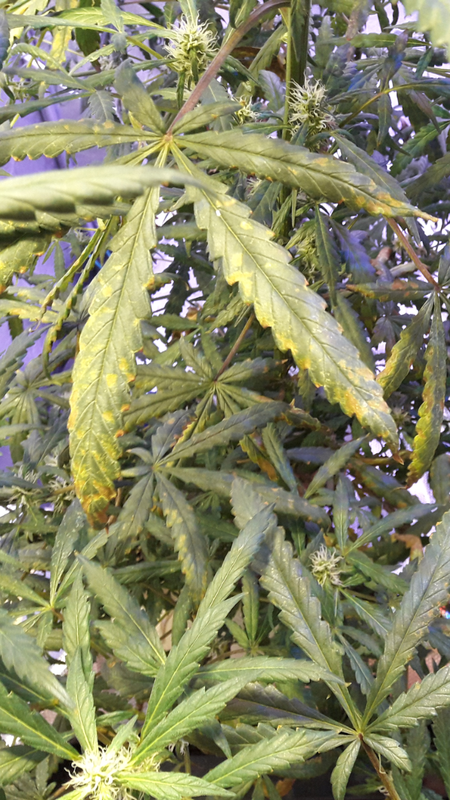 Mag deficiency is also commonly listed as causing rust spots, and they start on the lower leaves. This seems likely to me as the main issue. Your EC seems on the hi side to me. I got the best results running closer to 1.3 mS. Too hi an EC can cause burning. Have you checked your EC between rez changes or topping off? This is the rule of thumb I follow for setting the EC in the rez. It was recommended to me by several guys who are long time growers and it works great to dial in feed levels. I also found this more complicated chart that says basically the same thing. Potassium excess can and does cause the rust spot and browning of the other leaf edge, and cal/mag issues become present with that excess. 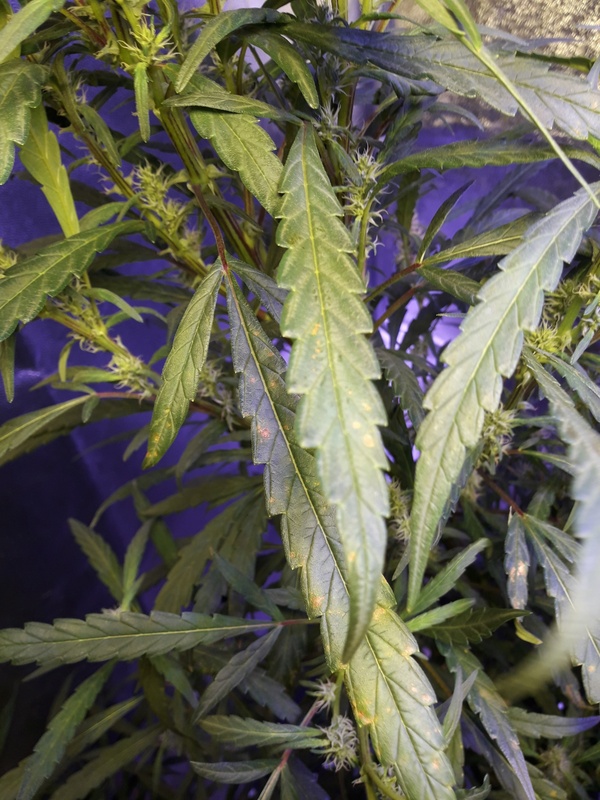 Typically in the last couple weeks of flower a plant starts to cut back on its nutrient uptake and don't need as much as they start to use stored reserves. 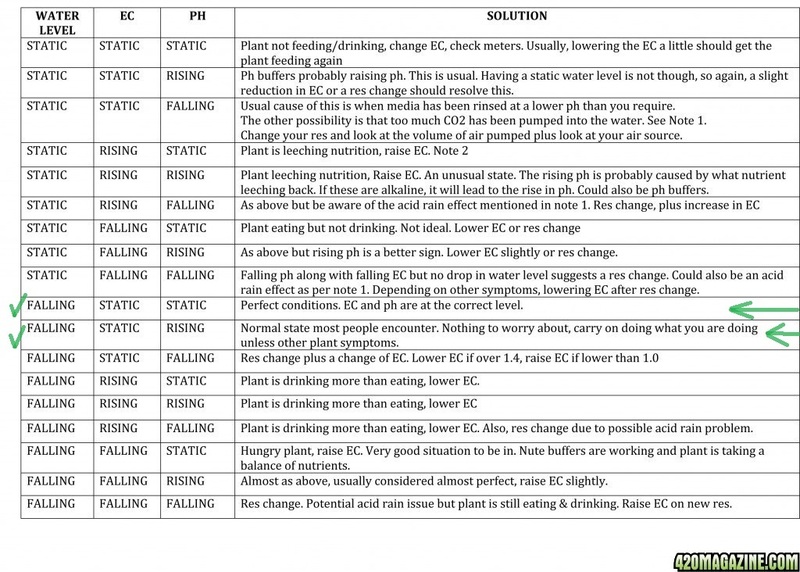 i have no experiences with aeroponics whether true or just more misting btw. How many liters is the working capacity of your amazon's tank ? I mean the level you choose to keep. Don't lower the pH below 5.5 in veg, but 5.5 ph is okay for flower if you can keep it from dropping and have a natural drift up. In my experiance you will get a overall better aeroponic crop, with a pH drifting between 5.5 and 6.2 for veg and 5.5 to 6.0 pH for flower. Topping your res with water is fine, but I would not top off with Aqua Flores every day. It will be okay if your Ec isn't super high all the time, let the plants use the nutes in your res and then top of midt way before the change. This will give you a indication of how fast your plants are eating, and adjust the next mix to that and build up once a week every 2nd week. If you can I would lower the room temps if you can, if you can run around 23-26C day and 20C at night. This will give you a better nutrient uptake and keep your nutrient solution around 18-20C. How large a res, for how many plants? Thank you all for your many replies! My solution tank capacity is 45-50lt, each day 5 are consumed by 4 plants, which are keep growing towards the lights, probably because of the heat. Summer is a difficult season to grow indoor, but in the night I keep the air circulating through the window, blowing out hot air with a spare extractor. I added a fan for the intake flow, blowing towards the plants. pH values are usually increasing each day by 0.3-0.4, so i keep them in the 5.8-6.1 range. I always check pH and EC values before and after topping, which worked fine in the spring, but with raising temperatures raised also evaporation, if not from the plants, from the tank itself. Everyday I have to lower EC by 0.3mS. I will try with a much lower EC and see what happens in the next few days. My lights are currently as high as they can be and yet a few top buds are growing towards them, some are already touching. I thought it could even be too much light, but the top leaves are the healthiest, the lower leaves instead are scorched. I don't foliar spray, the only one I did it was a few days ago on the lower leaves, with pyrethrum and mineral oil, which is organic and decays fast. I've just brought down EC to 1320uS, pH 5.9, I hope to see some changes. Its not what you spray with. Any liquid you spray will form droplets on the leaves. Those small droplets act like a magnifying lens and focus the light and thats what burns the leaves. If you are going to spray anything on the plants, do it right at lights OUT, so it can evaporate before the lights come back on. Sounds like your plan is good other wise, but you might consider trying some CalMag. Good luck!! What is your water temps, and could you post a picture of the roots? 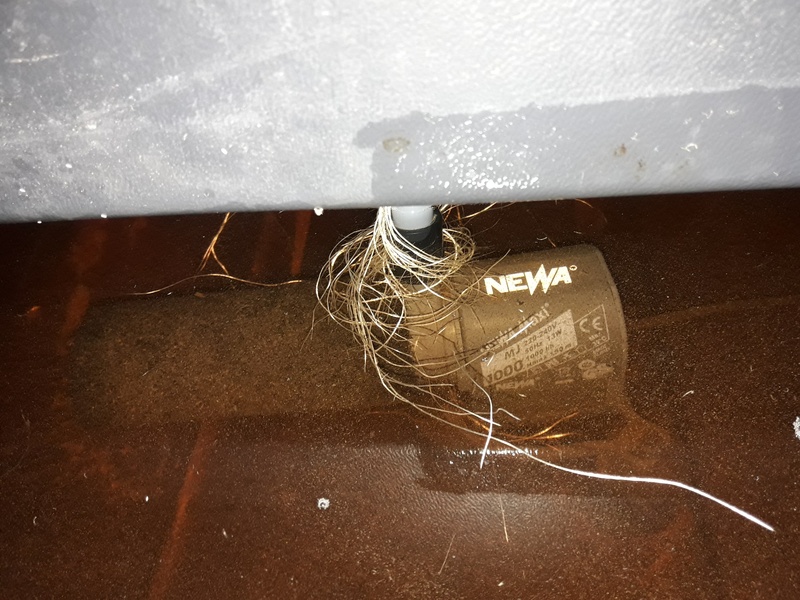 Heat is a PITA with aeroponics, free hanging root's and hot water is a disaster waiting to happen. So if it's the same strain as last, and the biggest change is the heat. Of course I sprayed during nighttime. the leaves were burnt before that and they didn't suffer any harm. I tried to avoid the top part where most part of flowers are. Water temp I think should be around 25-27, it never feels "warm" at touch. Roots have penetrated into the water tank, and they're all healthy and ever growing. I'll manage to post a picture of the roots. Your water temps are also hi. Ideally, you want to keep it no higher than about 23 C, or you risk root disease. Sounds like you dont have much choice though. On the other hand, I dont think hot water causes rust spots, but Im not 100% sure on that. The heat could be making the plants more susceptible to other problems though. Thats why I dont grow during the summer months. I cant keep tent or rez temps within range if its hot out. This is a part of the roots penetrated in the tank. I'm not able to look at the root chamber, since I should litf all the plants, but last time they looked this good. I know all of my temps are high, I hate summer. I always top up with cold tap water, so at least I gain a few degrees over the whole tank. In my house usually the max temp reached is 28,3, due to the lights switching on and the sun still in front of my window, but in the evening I manage to reach 26°C and so throughout the night. Tonight one of them grew a few cm against the light, now it's bent touching the lamp, but it's not burnt. What can I do to tell them "STOP GROWING!!"? What can I do to tell them "STOP GROWING!!"? The only thing I know that works is turn off the lights - but that has some serious downsides. Next time you will know to plan ahead a little more and train them to grow lower - maybe with a scrog or just LST. If they are not burning from the light, I would not worry toooo much - yet. You can also super crop those tall branches to bend them over sideways. It will slow the growth for a while, but might be better than burning them. In the mean time, it looks to me like your only option for the rust spots is try some added CalMag and/or one of the other supplements that have been recommended and see how it goes. I already FIMed all of them and bent two. One has developed 5.6 branches, one of which it touching the lamp, the others are 20-30cm below. The other one has grown the same number of branches, but thinner and taller than any. The two I just FIMed have grown tall, but maintaing the Christmas tree shape, stretching less and apparently producing more. I don't do any pruning once in flowering, I don't know what to cut. I eliminate the lower and weaker branches in vegetative, but later on I try to avoid anything that may encourage top growth, including cutting lower branches. Any tips about this? Pruning and trimming is a hotly debated topic. There are a number of good arguments - on both sides. If you count up all the votes on both sides, its about equally divided, but maybe a small majority are trimmers/pruners to one degree or another. I am a trimmer/pruner. Thats at least partly because I get bored and need something to do Largely though, I like to let light get down to the lower branches and bud sites. I only trim leaves after the first week or so of flower though. I dont know what else to suggest other than continue super cropping as needed to keep them out of the lights. You really dont have much choice at this point - unless you can re-build your tent to have a taller ceiling. I could raise the light a bit more, using half the hangers, but I know they will grow even taller, reaching them in a couple of days, like all other times. I noticed that brutally bending one of the thin branches, about at mid height, stimulated lower flowers, which are growing bigger than in all other parts of the plant. On the same subject I also tried topping off, sacrificing a top bud to stimulate lower ones. We'll see. Temperatures have dropped, I hope that'll last. Well, that one'easy : Defoliate à la Grand Master level. Focus on the tallest branches, and defoliate their tops up to the last pair of grown leaves (but leave the not fully grown ones from the tip alone, else you'll shock the plant). When you do this, the defoliated branches will takes 4-5 days before they resume growth, but the lower, non defol branches will keep on growing. This trick is usually used to even-out the canopy... but it also works in taming uncontrolled vertical growth. 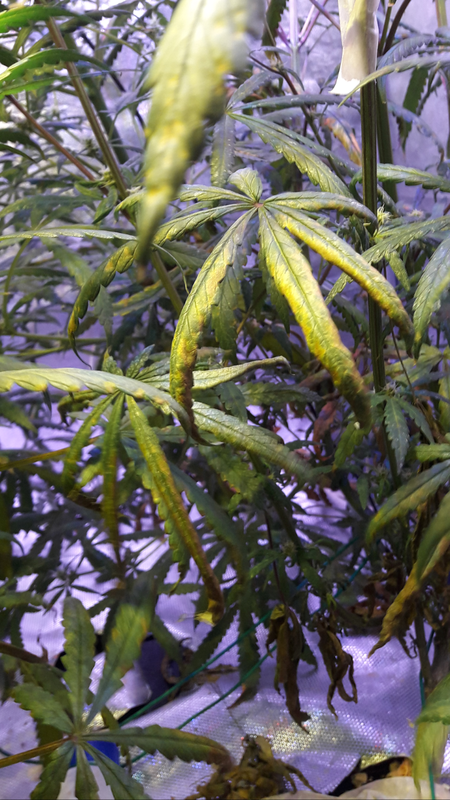 2 - The plant has access to unlimitted water, so the leave damage take much longer to show and look like what it is. 5.) Try and lower your temps. 24C would be ideal with that humidity. 1320-1350 EC? What measurement are you using? EC is not a high number. It's microSiemens/cm. If that is PPM depending on scale use by your meter manufacturer that is HIGH. As far as bugs causing this I'm not too experienced in that department. I know thrips can mess with the leaves and spider mites. A visual exam can let you know. Use a loupe or eyeglasses as some bugs are tiny. For our purposes, EC can be either microsiemens or milisiemins. Most meters will read it either way depending on how hi the number is. My Apera meter read in microsiemens until the number got higher than 999. Then it switched to milisiemens. When I was talking about using an EC of 1.3 above, it was milisiemens. I could also have said I used 1300 micosiemens, because its the same thing. One milisiemen is 1000 times as much as one microsiemen. So, 1.3 milisiemens is equal to 1300 microsiemens, and both equal 750 PPM on the 500 scale or 910 on the 700 scale.